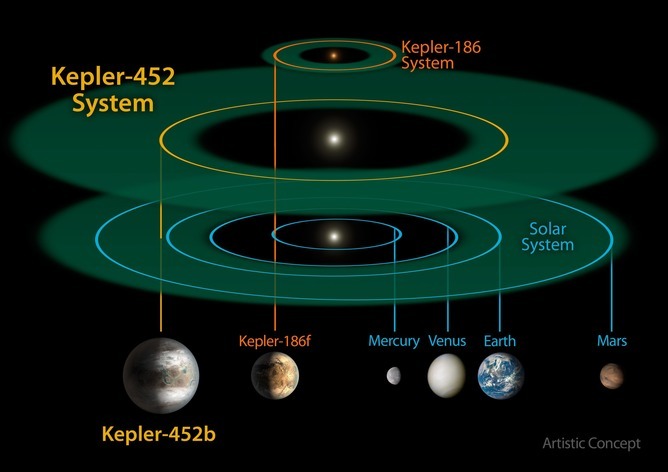 Since the recent discovery of Kepler-452b — more prosaically known as Earth 2.0 — scientific and non-scientific communities have been abuzz with excited speculation. The existence of another Earth-like planet in the so-called “Goldilocks Zone” – the circumstellar habitable zone with the right conditions to support liquid water – has reignited interest in that perennial question: are we alone in the universe? That same question has also been on many lips since last month’s launch of the Breakthrough Listen project, at which the search for extra-terrestial life (SETI) received a US$100 million dollar boost from the wealthy Russian Silicon Valley entrepreneur, Yuri Milner. Kepler-452b’s discovery has raised the intriguing possibility that, if there are other habitable planets out there, we may one day be able to relocate human civilisation to one of them. Those sorts of possibilities, for so long relegated to science fiction, have suddenly become credible. In 2010, the director of NASA’s Ames Research Center, Simon Worden, predicted the availability “within a few years” of a starship “that will take us between worlds”. Similarly, Stephen Hawking has long insisted that interplanetary relocation is the only viable option for humanity’s continuing existence. And while technological barriers are at present insurmountable, NASA engineer Adam Steltzner believes – according to a statement he made at the Smithsonian “The Future is Here” Festival in May last year – that he will see human footprints on Mars in his lifetime. Earth 2.0 has also posed questions that go to the heart of religion rather than science. For Jeff Schweitzer, former presidential advisor on science and technology to Bill Clinton, Earth 2.0 represents the “worst possible news for God” and all who believe in him. Whenever we consider space and all its possibilities, it’s easy, of course, to be dazzled by the sheer numbers involved. Some estimates put the total number of stars in the observable universe at a septillion stars – that’s a one followed by 24 zeros. math wizardry is not necessary to conclude we did not by chance find the only other possibly habitable planet among that huge population of stars. But for Schweitzer, the numbers are irrelevant — it doesn’t require billions, or even millions, of other possibly habitable planets. There only needs to be one other to disprove religious myth. In other words, even if Kepler-452b were the only other habitable planet besides Earth, it would – by itself – be sufficient to discredit the idea of a god. Not surprisingly, the announcement of its discovery is therefore pregnant with both scientific and theological significance. But before we rush to abandon whatever faiths some of us still have, it’s worth considering the basis on which Schweitzer proclaims the “death of God”. Unfortunately, he knows next to nothing about textual exegesis – the critical examination of a text. His argument that Kepler-452b definitively disproves God rests on the thinnest of exegetical wafers. Schweitzer wants us to accept that, because the Genesis creation narratives speak of life in the Earth-bound singular, any proof or even possibility of extra-terrestrial life falsifies the Bible’s own claims about the god who “instructed” its authors. If there were other lives or habitable planets apart from Earth, God would surely have told the biblical writers to mention them. Because he didn’t, the Bible is therefore false and its God non-existent. Of course, at the most basic level, Schweitzer is right. The Bible does only concern itself with the creation of life on this planet. For all its talk about “the heavens”, there is no mention of other possible Earth-like worlds, nor do any of the writers enquire into the existence of alien lifeforms. But is this really the fatal oversight that Schweitzer believes it to be? natural science as a subject of study was not cultivated in the schools of Palestine or Babylon. The rabbis were aware of, but largely uninterested in, cosmology as such. Why? Because they were sufficiently concerned with the problems of this world, without worrying about speculative possibilities of any others. That is to say that the Bible is simply uninterested in the maybes and what-ifs of astrophysical abstraction. On the contrary, the Bible in its entirety provides a narrative framework for understanding how this people (the community of Israel and then, later, the Church of Jews and Gentiles) relates to this God. There is something deeply grounded about Scripture’s intention – to not enquire abstractly into what may be, but to ask instead, how then should we live, here and now, with ourselves and with one another? To require of the Bible that it also engage in cosmological speculation is as nonsensical as demanding that we find a recipe for butterscotch duff in Newton’s Arithmetica Universalis. This is not, of course, to deny that the discovery of Earth 2.0 is freighted with theological significance. No longer living in the time of Scripture’s composition, we do not have the luxury of ignoring the scientific realities that were, at one time, mere curiosities. Theologians, religious leaders and people of faith should feel inwardly compelled by such realities to ask probing questions about the nature of the God in whom we say we believe. What does it mean to say that God is pro nobis (for us)? Is he also for all other possible lifeforms? Why not, we might ask? Is there still something unique about life made “in God’s image” that may not of necessity be true of any other life-types? Can we, in good faith, confess that God is the maker of heaven and “the earths”? Perhaps particularly, is there anything in the Scriptures that would prevent us from making such a confession? These are just some of the questions that we should carefully ask. But in all honesty, such questions are only in fact the natural extension of questions that have already been asked by the various eco-theologies. Ecotheology has intentionally sought to destabilise the anthropocentric, geocentric narrative of normative doctrine; to ask now about the impact of extra-terrestrial habitation on our concepts of God is different only by degree and not by kind. But if we are to do so, we should be guided by a far more sophisticated exegetical grammar than that employed by Jeff Schweitzer. We will need to learn how to read our foundational religious texts with nuance, and with an eye to the discursive whole, rather than contenting ourselves with facile proof-texting. Theology – just as much as science – needs to keep an open mind and an open heart. If it does so, then that will be in fact good news for God. Mark Lindsay is Joan F W Munro Professor of Historical Theology at University of Divinity. This article was originally published on The Conversation. Read the original article.